"Taught by Special Forces personnel as used in real world missions"
"Comprehensive CARVER assessment with complete analysis and reverse engineering to protect your critical infrastructure, personnel, property, and process"
The CARVER Assessment Course (CAC) is designed for facility security, law enforcement, and emergency management professionals charged with planning for and implementing protective measures for personnel, facilities, and infrastructure. This course is available for On-Site Training. We will bring this course to your agency or company. The Department of Defense (DoD) uses CARVER as an offensive target analysis tool and it has become a very effective defensive tool for Critical Infrastructure Protection. The CARVER workshop includes a series of classroom lectures, practical exercises, and the students will conduct of an actual assessment of a government or private sector facility. The CARVER Assessment course is designed for facility security, law enforcement, and emergency management professionals charged with planning for and implementing protective measures for personnel, facilities, and infrastructure. 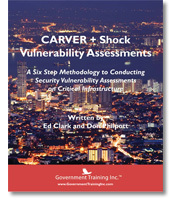 CARVER is the base for an All-Threat – All-Hazards assessment tool. This workshop, taught by a CARVER, Risk and Vulnerability Assessment experts provides you with a proven methodology, the knowledge, and the training to conduct an all hazards assessment and secure your assets. This course provides the processes and tools for using CARVER, with a threat vs vulnerability based approach. - Identify threats and vulnerabilities of all sorts and apply risk management processes for incident planning. - Become familiar with the importance of conducting the analysis of your assessments and develop the necessary mitigation tools for prevention. Students receive their own copies of the course briefing materials and CARVER tools for data collection and reporting. Students will receive a Certificate of Successful Completion from Government Training Inc. – Center for Security Best Practices. How CARVER “targets” the Critical Infrastructure and how you can prevent and / or mitigate through comprehensive Threat, Vulnerabilities, Criticalities, and Risk Assessments with Proactive Threat Analysis (PTA²™) prevent and /or mitigate your risk to the 3 Ps (personnel, property, and process’). The Nation’s Critical Infrastructures face a myriad of physical and technical threats. Each of these threats, whether natural, man-made, accidental or intentional, carries a certain level of risk that could compromise national security, public safety, and/or the economy and facility owners’ bottom-line; protection and profit! The first step in securing Critical Infrastructures is the performance of an all hazards full spectrum “threat based” assessment process. Students will conduct an assessment of an organization’s threat, vulnerability, criticality, and risk to operational assets and the consequence of their degradation. The successful execution of an all hazards requires highly skilled, knowledgeable and trained personnel. During the CARVER Methodology - Target Assessment and Analysis workshop, you will learn how to plan and conduct a targeting assessment using the CARVER assessment tool. The workshop reviews the basic elements of planning, executing, and reporting an all hazards assessment and countermeasure development. You are taught how to reverse engineer the CARVER results and develop a comprehensive and proactive prevention / mitigation program. Very knowledgeable on varied scenarios that could present themselves. This course would be beneficial to any anti-terrorism instruction or force protection initiative. Very worthwhile for all government sectors. Instructor was excellent - based presentation on the experience of the students. Handout materials were concise and focused to the course at hand. Friendly, informative, and inclusive training. Thank you! Our agency could use these lessons on risk management doctrine in which this instructor seems well versed. P.S. The instructor got straight A’s in student evaluations. Working with your company has been an overwhelmingly positive experience for us. People are still raving about the class, and we have had several inquiries from other counties about your company. Your instructors were a great team, and super to work with. We are considering additional classes in the future. I am sure you will hear from us again. *Please Note: Dress for this 4-day workshop is casual. In essence, any security professional responsible for conducting and documenting physical or systemic security evaluations and audits. Registrations are payable by Visa, American Express, MasterCard, Discover or Check. There are several 10-15 minute breaks throughout the day. You may designate a substitute in writing any time before the course. Cancellation requests must be sent in writing (email or fax) and will be subject to a $100.00 processing fee. No cancellations or transfers are accepted within 2 (two) weeks prior to the course start date or later. PLEASE NOTE: No shows will be liable for the entire registration fee. In the rare occasion that a course is cancelled or postponed, please note our reimbursement is limited to paid tuition only. We're sure you'll be satisfied with the content of our courses. If you're not, please tell us why in a brief letter and we will credit your investment towards another Government Training, Inc. course….You risk nothing! Airline Tickets: It is recommended that you do not make non-refundable airline reservations – There are sometime circumstances out of our control (weather, natural disaster, other emergency situations) that would cause us to postpone our scheduled course.